Bake cookies as directed on package. Cool completely. Spread each cooled cookie with frosting. Sprinkle with coconut. 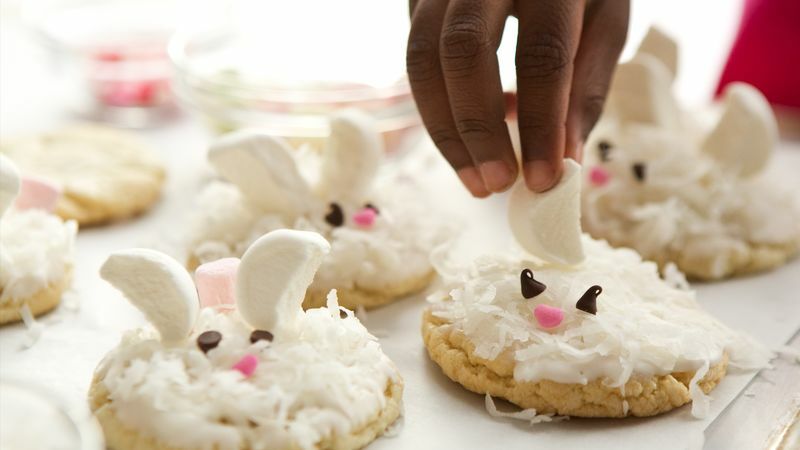 To make bunnies: Pipe small dollop frosting onto miniature chocolate chips for eyes and heart-shaped sprinkle for mouth; press into coconut. Cut large marshmallows in half crosswise; cut each in half again for bunny ears. Dip one end of each bunny ear into frosting; place ears on sides of head. Pipe small dollop of frosting on pink miniature marshmallows for tail.